My name is Samantha Washington and I have a confession. I think my mother might be off her rocker. I’ve known for a long time that she had the power to drive me crazy, but I’ve finally come to the realization that I’m not the crazy one. After all, I’m a successful business owner. I own a mystery bookshop in North Harbor, Michigan. You may have read about me. V. M. Burns writes about my life in her Mystery Bookshop Mystery Series. As we get ready for the release of the fourth book in the series on April 30th, I have finally figured out that I’m actually pretty rational. It’s my mother who’s a few fries short of a happy meal. How did I come to this revelation? I agreed to be a bridesmaid in her wedding. One of the first clues that my mom wasn’t playing with a full-deck should have come when she introduced her fiancé, Harold Robertson, and then told us she was getting married in three-weeks. A wedding in three-weeks is fine if you’re planning a simple ceremony at the Justice of the Peace or flying to Vegas to get married by Elvis. However, planning a full-blown wedding with flowers, a cake, three-course dinner and all of the trimmings in three-weeks is…challenging. Add in the fact that all of this needs to happen by Christmas Eve and you’ve stepped over the line from challenging into full-blown crazy-land. I thought things would get better when Margaret, my mom’s soon-to-be-sister-in-law, hired a wedding planner, Lydia Lighthouse, to help plan the wedding. Boy, was I wrong. Lydia Lighthouse was a sharp-tongued, domineering, shrew. I didn’t think anyone could anger my mom’s fiancé, but when mild-mannered Harold found out that Lydia was brow beating his beloved, that’s when the sleeping tiger inside became enraged. When Lydia was murdered, the police focused on Harold as their number one suspect. I couldn’t let them ruin my mother’s happiness by arresting the wrong person. 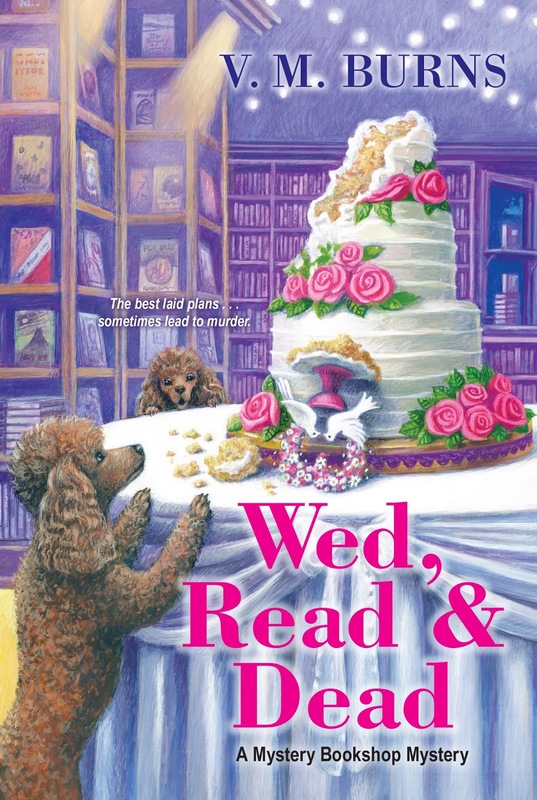 If you’re interested in finding out if Harold and mom get their happy ending, order WED, READ & DEAD. 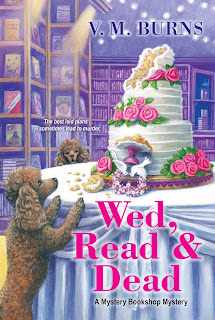 I'm looking forward to reading Wed, Read & Dead -- sorry about the bridesmaid's dress, Samantha! I love wedding themed cozies. This is a lovely cover. Thank you so much! I love my illustrator. She does a fantastic job, especially when it comes to capturing my dogs. If the Pinterest example of the dress are accurate, you should go into the witness protection act and leave...quickly! LOL - Sadly, there are a lot worse bridesmaid dresses out there.